Last Update 3/12/18 – WP Fastest Cache continues to make improvements, and I’m always learning, so I’m constantly updating this post. Following are screenshots of all the basic settings in the free version. Below the screenshot are more details for settings that have options or more clarification, if needed. Plus, at the end, you’ll see how to purge the plugin’s cache. NOTE: Be sure to scroll to the end of the plugin’s settings and click the Submit button to save your changes. NOTE: If you run MediaVine ads, you will need to hard code the CSP to block non-HTTPS ads from running on your site instead of the Insecure Assets setting in the MediaVine plugin. Contact me for help with this. It’s an easy and quick thing to do. And is way better than using the 2 other caching plugins they recommend if you’re serious about speed and stability with your site! You wouldn’t believe how many site audits I do where folks install plugins and never configure them, or even turn them on! You actually get a whale of a lot in caching help just by clicking Enable on this plugin. Preload compiles all PHP (code) and SQL (database) calls into a static HTML file for faster delivery. Do not use if you are also using Cloudflare. Less than 10k hits/day, turn on preload. More than 10k hits/day, don’t turn on preload. You might want to monitor your hosting resources, or check with your CDN provider if you are using one other than Cloudflare. This will save on your hosting resources too. If you need to turn on others, do so, just keep an eye on your hosting resource load. Subscribers, such as on a member site would also be considered logged in Users. And you want them to see the cached version of the site’s content. So, you want to leave this setting unchecked. Leave this unchecked unless you have a totally separate mobile version of your site. In other words, if your theme is fully responsive, it is resizing for mobile. It is not a separate theme version. If you do have a separate mobile version, you’ll want to get the Premium version of this plugin so you can create a cache version of it. As of Sept 2017, Clear all Cache for the whole site is the default setting when you publish a new post. You’ll likely want to leave it set this way due to how many places your new post may display on your site, such as any type of recent post listing. When you update an existing post, only select site elements are affected, so I recommend setting the plugin to only clear cache on them, instead of losing speed on the rest of the site. READ this whole section before turning these elements on!!! Minification and combining static elements can definitely speed up your site. They can both definitely break some sites, or site functions too!!! If you choose to use any of these settings, turn them on one at a time and test the beegeebees out of your whole site. Be sure to clear the plugin cache and your browser cache and use an incognito/private window for those tests. There are two common places to set minification – via a local caching plugin and via a CDN like Cloudflare. Do one or the other, not both! The minification in most all plugins is more aggressive than Cloudflare and will generally render better speed. 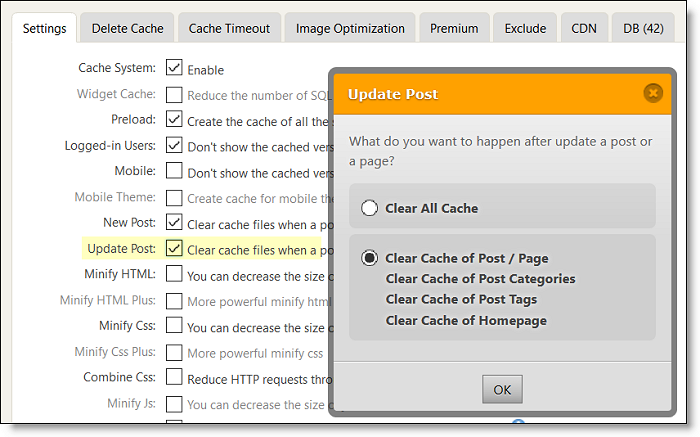 The free version of WP Fastest Cache has less aggressive settings than the paid version. The more aggressive settings are grayed out on the free version. Combining CSS and JS will not yield as much speed improvement on HTTPS sites as it will for non-HTTPS sites. That’s because HTTPS takes advantage of the HTTP/2 protocol, which delivers more elements in parallel by default. As HTTP/2 improves, combining CSS and JS will become less necessary to improve speed. But we aren’t there yet. Combining also carries the greatest risk of breaking site elements, due to so many plugins having CSS and JS elements, besides those found in just the theme. Files that don’t play well with this setting can be excluded from the combo. So, while combining works, it may take more tweaking and testing to get it to work well on your site. Contact me if you need help with these settings. This type of compression makes a zip version of your site elements, which the browser later explodes. It delivers up to 85% speed improvement. But, it only works completely on Apache servers. If you’re on Litespeed, it already has a similar function built in, called APC, which will show up in speed test results as Gzip. Adding Gzip via this plugin will speed up the elements that APC can’t do alone. Just don’t expect as drastic a speed improvement as on Apache, simply because it needs more speed help. If you’re using Cloudflare, it uses Brotli compression, which is even better than Gzip, but not all browsers support it fully yet. Brotli will also display positive for Gzip in speed tests. This setting needs to coordinate with your CDN, like Cloudflare, if you are using that. Turn this on in the WPFC plugin. Then at CloudFlare, set Browser Caching to Respect Existing Headers. You may need to run tests to ensure this combo is the one that works best for your setup. Contact me if you need help with your settings combo. Definitely turn this on if you don’t use emojis in your content or comments. You’ll get a small speed improvement all over your site. This setting could significantly speed up your site. But, like all JS related settings, it could also break your site. This setting will speed up most sites, as it pushes the calls outside your site to Google way down in the load order. However, it could also reduce your Google PageSpeed Insight (GPSI) score, depending on how much has to load prior to the Google fonts loading. GPSI wants to ensure that your theme displays default fonts quickly until the Google fonts load. Lazy loading works on images to provide a smaller placeholder image instead of the actual image, on any images that are below the fold on the device being used by the visitor. 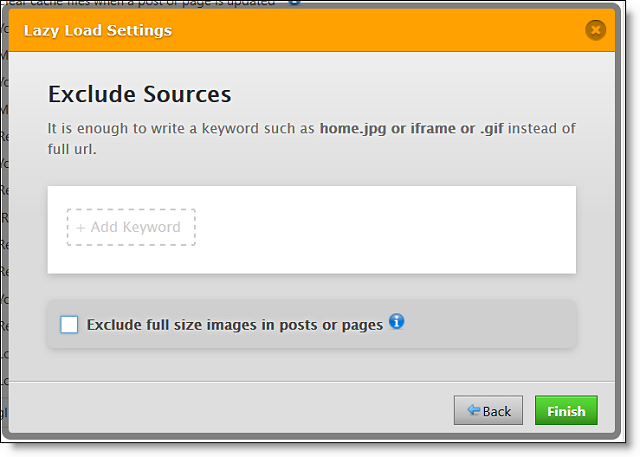 This allows Google to index the image attributes without slowing your page load down. The actual image is loaded once the site visitor scrolls to that section of the post/page. Lazy Load also works on videos when iframe code is used to embed them, and when the video appears below the fold. It will not work on videos using oEmbed. You can also select your own placeholder image instead of the one provided by WPFC, but it is sufficient. FYI: there is no option to turn of lazy load on a per page/post basis. But, when you click the Next button, you will see another screen to Exclude Sources. These will be applied globally, though. Be sure to click the blue Submit button at the bottom. You should get a green bar notification at the top that your settings have been saved. Click the Delete Cache tab at the top. And then click the blue Delete Cache button. If you turned on minification and/or combine, then you will also need to delete both caches (both buttons shown below) when you make a css or style change to your theme, or one of your plugins that has a style sheet updates. I would not recommend using the Other CDN Providers setting if you use CloudFlare. I have not tried the integration settings for MaxCDN or Photon, so can’t say how well they work or not. 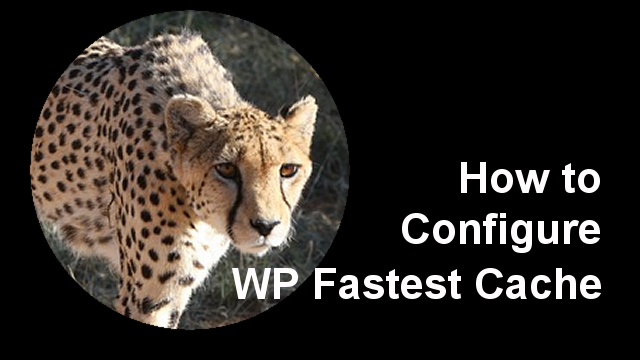 WP Fastest Cache does have a premium version available. You have to download and install the free version first, and then you can upgrade from within it. There is a one-time payment per site. For ultimate speed, it is definitely worth paying for!! The minify and combine features are far more aggressive in the paid version and there are other features to help with database cleaning and reduction of calls to your database. My site audits go deep and reveal the real drags on your site, plus performance holes that are letting bots eat up all of your system resources, making the site slow too. Want to learn how to do site audits? My Webmaster Training teaches designers and technical VAs how to set up sites securely, convert them to HTTPS, and make them fast. Hi MaAnna! 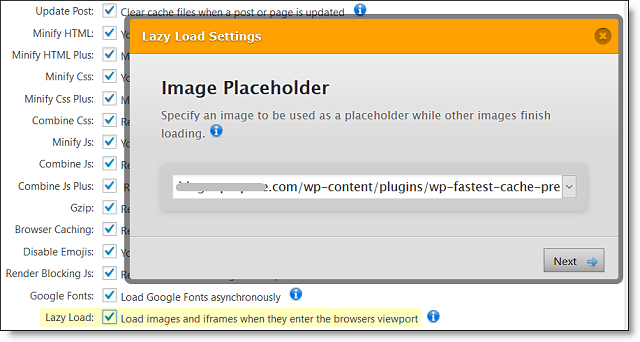 If I have WP Total Cache, can I change it for this plugin without any problems? Mary, when you delete most caching plugins, they leave behind code and directives in files like .htaccess and wp-config as well as their cache folders in the Plugins folder. I know for a fact that WP Total Cache does. All of these are in areas that most site owners don’t feel comfortable editing. That said, in site audits I often see orphaned files and folders from site owners trying all sorts of different plugins, and the latest one they are using seems to work okay. Excellent tutorial MaAnna. I have just installed Wp Fastest Cache with just fewer settings my Website loads even faster than using other big names caching plugins. I have noticed that they have a premium version too with more speed optimization settings. I would definitely give it a try. Hi Bahassi, so glad this has helped your site run faster!!! It’s just easier to setup than most, and is actually effective. I have installed WP Fastest Cache on my website. However, my post grid on the blog page keeps disappearing every 24hrs, leaving behind a white blank space. I’ve had to constantly log in to update the blog page so that recent posts can re-appear on the grid layout. Please advise how I can fix this. Hi Paul, that plugin had a glitch a while back with not properly clearing the cache on dynamic pages, like home page and archive pages. I changed the tutorial for the new setting that seems to have fixed it, which is to clear all cache when new posts are added. But, that doesn’t explain the blank white space issue. If you tried other plugins prior, there could be orphaned code snippets or directives that are conflicting, or another plugin conflicting, or server-side caching, or theme conflicts. So, lots of things can affect it and would need to get under the hood to have a look and rule out those things one by one.